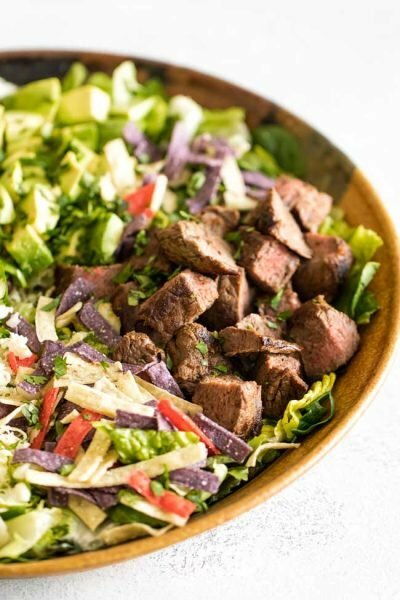 Need a quick and tasty dinner idea? 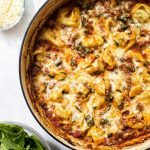 This baked tortellini fits the bill – fresh tortellini pasta gets baked up in a hearty sauce and topped with mozzarella cheese – 20ish minutes in the oven and it’s ready to go. It’s perfect for busy days when there’s little time to think about dinner. In my house, there is one convenience product that ranks first on my list of go-to ingredients to help get dinner on the table fast and that’s a packet of fresh pasta. You know, the ones in the refrigerator case near the produce section? 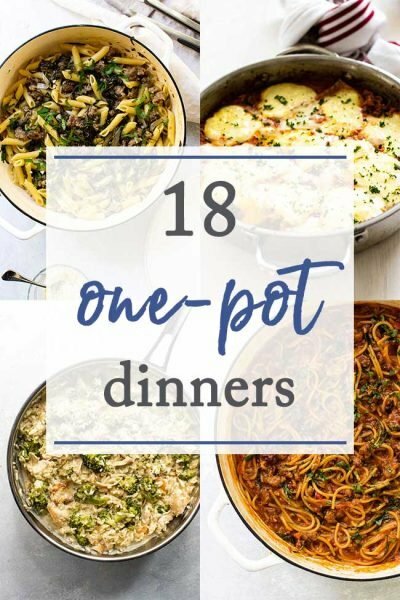 It’s a guarantee that at least one or two packets end up in my cart every time I grocery shop and for good reason – a packet of fresh pasta is the answer on those nights when getting dinner on the table seems impossible. 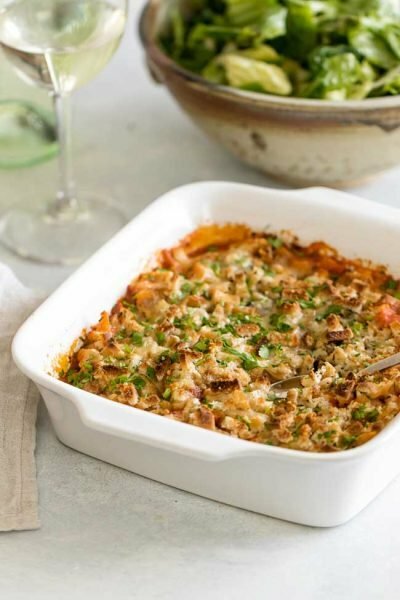 I’ve made this baked tortellini several times in the last few weeks and love it – it takes no time at all, but looks and tastes like it took much longer to make. I’ve switched it up a little each time, but I really like this version with ground turkey. 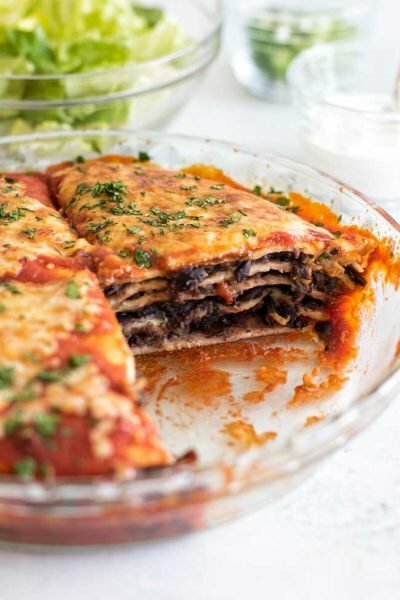 It’s hearty and filling, but you could easily leave out the meat and just make it with your favorite tomato sauce. I use fresh cheese tortellini because I don’t have to boil it beforehand. It goes right in the oven as is and comes out perfectly cooked. If you want to lighten the calories ground turkey is a good choice, but I’ve also made this with ground beef and it’s delicious. Or, if you’re really short on time, skip the meat and just bake up the tortellini with the sauce. No pre-cooking required! Use your favorite jarred marinara sauce or make your own from scratch if you’re feeling adventurous. Spinach adds some color and healthy good stuff, but it’s totally optional. Cheese! And plenty of it. 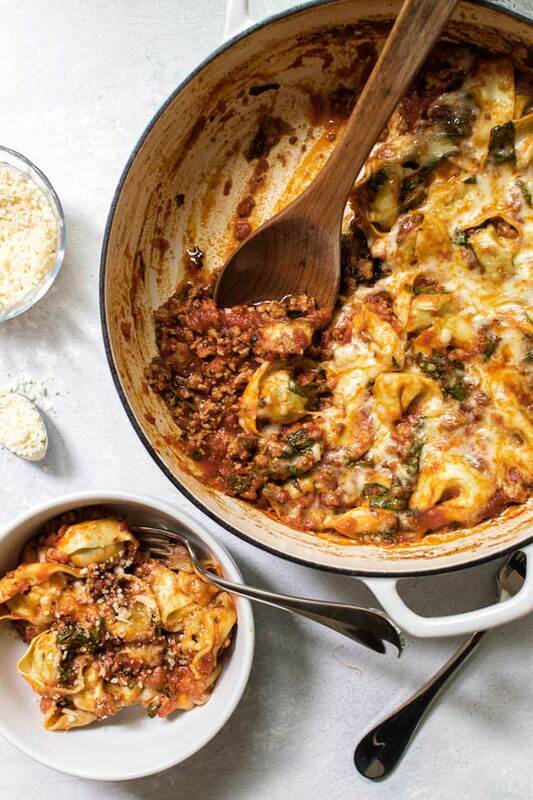 This baked tortellini makes good use of simple pantry ingredients and serves four with bread or a salad on the side. Heat the olive oil in a large pan over medium heat. Add the ground turkey, breaking it up with a spatula or wooden spoon. Add the seasonings and cook the meat until it’s no longer pink on the outside. Add the spinach and stir it into the beef. Once it starts to wilt add the marinara. Bring the sauce to a simmer and add the tortellini stirring to coat it evenly in the sauce. Sprinkle the mozzarella and Parmesan over the top, cover the pan loosely with tin foil (or oven-safe lid), and pop it in the oven. Bake it for 15 minutes, uncover it and let it bake for another 5-10 minutes. This recipe calls for ground turkey, but you could easily substitute ground beef. 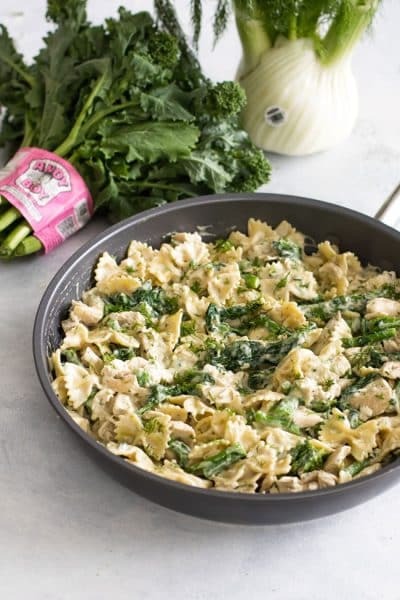 To make it even easier, skip the meat and just combine the tortellini in the baking dish with sauce and the spinach and bake. Do you have a recommendation for making it ahead of time? Add minutes to the baking from refrigeration or would you bake it first and then just heat it up after refrigeration? Hi Jodi! You can assemble the dish and then pop it in the fridge. I would add a few extra few minutes to the bake time – maybe five to ten minutes? There are no dumb questions right!?! 🙂 do you cook the tortellini first? I just wanted to tell you that I have made this recipe on numerous occasions and everyone absolutely loves it, me included. Thanks for another great recipe. Such a fantastic recipe! Easy, cheesy, and delicious! 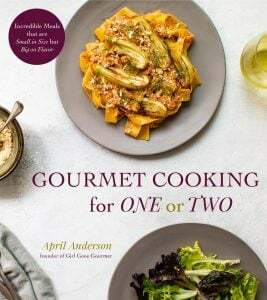 Made this last night, easy, simple to prepare and delicious, a big hit with hubby. Thank you for sharing the recipe. This was amazing. Just made it tonight. Mmm I could so go for a big bowl of this right now!! It looks like the perfect comfort food dinner 😀 yum! Thanks Rachel – it is a perfect comfort food, especially this time of year! 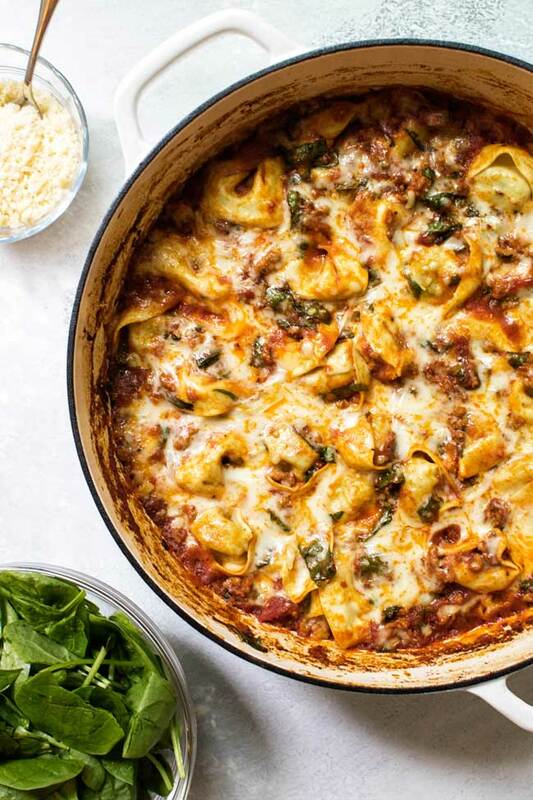 Totally craving tortellini right now, this baked dish looks so delicious!